Despite an attractive veneer, Planet Alpha offers rote and shallow platforming. Try Playdead’s Inside instead. Planet Alpha opens with you, an elongated humanoid in a spacesuit, limping across a desert, eventually collapsing at the (surprisingly literal) mouth of a cave. One fade-to-black later and you’re waking up, fully healed and ready to jump, run, crouch and drag your way through the alien landscape. As well as that basic side-scrolling platformer toolset you have the ability to turn day to night and night to day. Rather than putting you forward or backwards in time, this is used to manipulate your environment. Plants are particularly susceptible to changes in light, so full sunlight makes golden fungus unfurl to create new platforms, or clumps of foliage expand to offer hiding place. Moonlight, meanwhile, offers pink fungus platforms. But although it has the potential to be an interesting project, supported by a pleasant low-poly art style, Planet Alpha quickly reveals a lack of depth and mechanical polish which make playing a real chore. Moving through the world was not an enjoyable experience, especially during stealth segments. For example, I found it hard to tell with any degree of precision whether an enemy’s laser beam was going to hit me while I was behind cover. That was because I couldn’t reliably get a sense of their line of sight or which parts of the terrain would definitely shield me. Some sections were thus brimming with trial-and-error deaths, or getting laser-fried when I thought I was behind a rock. Relatedly, it wasn’t always clear which plane an object was on. For example, I waited a while for a gap so I could safely pass a giant creature’s stamping feet only to realise those feet were actually on a background layer and therefore I could saunter past at leisure. Another recurring irritation was in the sliding sections where your character skids down a slope and must navigate obstacles or make jumps without stopping. These change up the pacing, but they’re also where the hand of the developer is most obvious. You start to slide, then you either anticipate an obstacle or jump, or you die. If the latter you go back to a checkpoint and start sliding again until you do it correctly. 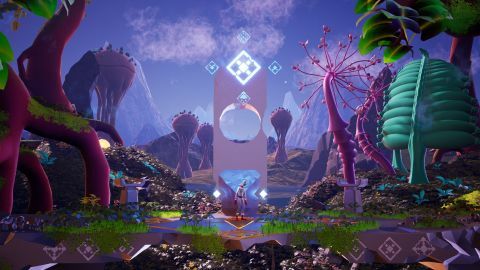 This rinse-and-repeat tedium is not unique to Planet Alpha and the checkpointing is generous enough, but Planet Alpha also does nothing to invigorate what are essentially cut scenes with the ability to fail. In terms of the art, there are some cool touches. The backgrounds are visually interesting, particularly early on, and there’s a nice moment involving a long-necked creature which seemed to be a nod to the original Jurassic Park movie. Later levels feel less visually interesting, though. A dark cave had some pretty moments but mostly induced a headache as I squinted as the patches of light on a largely black screen, while a lava section appeared to match its dull running and jumping with a one-note visual experience. Pretty backgrounds also contrast with the rather humdrum plane the player must inhabit. Offering a little variety are glowing orbs which transport you to dreamy, low-gravity pocket universes populated with bonus jumping puzzles. These are fine but not particularly interesting. In fact, the puzzles are generally fine; mostly unmemorable and occasionally frustrating, especially if they involve stealth. The puzzles also don’t take the day-night conceit anywhere interesting. During a chase sequence the moonlit fungus platforms are needed so you can cross a gap. I started the chase in daylight, saw the need for night, changed time, and was killed by a robot before the fungus could bloom. I respawned with the night already in place and completed the chase easily—not an interesting resolution. A useful counterpoint here is Playdead’s Inside. Regardless of whether you enjoy its tone, it uses visual and mechanical design to deliver a weird bleakly comic story, the puzzles are engaging and the animations elevate the nameless character to a real presence. Planet Alpha struggles on all counts, coming off as loose instead of tight, vague instead of purposeful, and dull instead of compelling.